Much of this information will be out of date, but is left for historical interest. Local weather variations causing signal-strength and quality drops on V2.6x cards, and higher BER on the V2.3 cards (only shows on V2.6 cards when very bad). This happens during high rainfall and perhaps snowfall periods, due to ice crystals and water-vapour in the atmosphere and perhaps films of water or accumulations of snow on the LNB or dish. Local variations due to high wind if your antenna is not securely mounted. Differences between driver software and devices when talking of the terms Quality (most consistent), SNR, and "Strength" (least consistent). Variations in signal strength across Europe which show as variations SNR & signal quality on the V2.6x cards and as non-zero BER on the V2.3 cards. These variations may also be caused by weather conditions or other issues at the uplink station. I no longer have the V2.3 cards in use - well, until I replaced the 2.6D card in the Backup PC (Stamsund) as it may have been dropping PIDs. Wide-bandwidth, or even out-of-band transmissions from the Hotbird-6 satellite (or adjacent satellite?) which cause non-zero BER values lasting from several minutes to several hours, but only to be observed on the V2.3 cards. The signal strength, even as reported by the V2.6x cards, remains high during these periods. The service was moved to Eurobird-9 during November 2008 and these problems have not been seen since. Variations in TelliCast missed and recovered packets due to TelliCast server issues - compare rates with data volume and signal strength. This data is snapshots of the TelliCast statistics display. The numbers are rather small, and packets per day would be the best display scaling, but MRTG only offers packets per hour at best. Therefore, it's possible that for the backup PC, at least (which just takes Meteosat-8 rapid-scan and Meteosat-9 full-scan), the recovered packets may stay at zero for the display, rather than their actual non-zero value. This appears to be the best that can currently be done. The size of the FSY file (or files) gives an indication of the amount of data being temporarily buffered from the DVB stream. It will be larger if more data is configured (e.g. for Metop as well as Meteosat-9), and it can also be larger if the receiving system is less than optimally configured when data segments which cannot be reassembled (because the data stream is incomplete) are accumulated in the FSY file. During normal operation, the file will grow during the first 24 hours of operation, and be reasonably stable after that. Periods of data loss and the occasional transmission of large files (e.g. VGT4Africa) can cause FSY file increases. There may be more than one FSY file if you configure the recommended 300MB RAMdisk - it's the total size which is plotted above. For the TelliCast 2.5.17 client, FSY files are no longer used, so the space occupied by the tmp_directory files on the RAMdisk or hard disk partition is plotted instead. Large spikes here likely indicate TelliCast operation without the necessary data managers being run, and very large spikes may be edited out to preserve the normal-running information. How can I set up similar monitoring on my own system? More information on monitoring EUMETCast and using MRTG for monitoring other information. TelliCast and the network throughput. The way the DVB and TelliCast system works - in a nutshell - is this. The data from the satellite is tagged with a packet identifier called the PID, and using the setup for your DVB card or box you can choose which PIDs the card should handle. As there are only a limited number of PIDs which some DVB cards can handle, the PID is used as a rather coarse-level control to break the data stream down into reasonable-bandwidth chunks. The data is sent from the DVB card to the TelliCast receiving program as an IP multicast stream, delivered over UDP for best efficiency, but meaning that delivery isn't guaranteed, hence the susceptibility of the system to interruptions by high CPU, disk and network loading. The data is further divided into streams by using "channel names". Here are the channel names for EUMETCast. A single PID may contain a number of different streams, but each stream will have a different multicast address. The multicast address of the "Announcement channel" stream is fixed, and that channel talks to the TelliCast program saying what data is available. If you have configured the TelliCast program to accept a particular data channel (e.g. EUMETSAT Data Channel 2 - for the HRIT data), and you are allowed access by your eToken, when new data is available for that channel the TelliCast program will "join" the multicast being sent out via the DVB software, and when the DVB software finds a "joined" channel (i.e. one with some listeners), it will send out the data packets for that stream to the appropriate multicast address. In computer networking terms, the packets originate from a multicast network 224.0.0.0 with a netmask 240.0.0.0. For example, for [Metop AVHRR] data, the source address is 224.223.222.239:2390. The TelliCast software has the address of an "announcement channel" set by its recv.ini file, which also contains the address of the network interface (typically 192.168.238.238). So the TelliCast software should be able to join a multicast group on the specified interface. One thing which some DVB software appears to omit is the command to tell Windows that any request for the multicast network (224.0.0.0) must be routed via the DVB virtual network interface (192.168.238.238), and you may need to add that route with a manual command. However, as the TelliCast software already knows exactly which interface to use, why you even need the route command is not yet clear..... More about multicast programming. The recv-channels.ini file will determine whether or not TelliCast accepts a particular set of data announced by the DVB network. If that data isn't accepted, the network interface doesn't send it, and it won't appear on the flow reported by the DVB pseudo-network (although this behaviour appears to differ between the SkyStar PCI and Dexatek/DVBWorld USB software). Perhaps this is handled by having more than one multicast group associated with the TelliCast software. Perhaps there is one group per data channel? Multicast Mechanics. 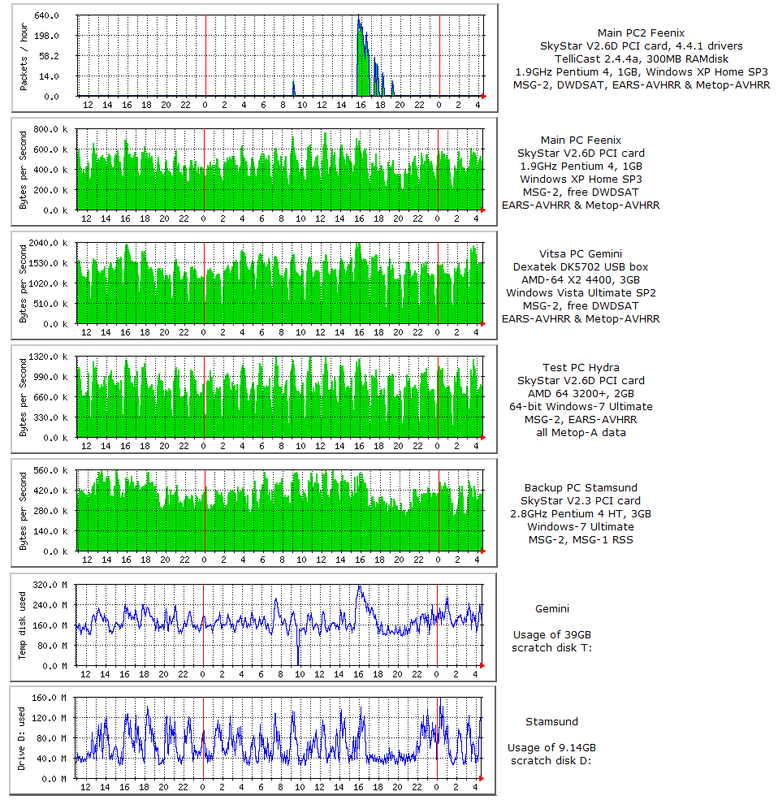 It is the sum total of data sent to active multicast channels which is plotted above as "throughput". Note that as some of the data is compressed internally to the TelliCast software, the network throughput between the DVB interface and the TelliCast software may be less than the data throughput reported by the TelliCast software. To reduce the load on your PC, you can either disable individual PIDs in the DVB software (right-click the green satellite icon , Setup4PC, Data Services), or you can select the channels you want by editing the recv-channels.ini file in the TelliCast software. 11:50 UTC, Wednesday, 2012 Jan 18, week 3. Replaced Dexatek box on PC Gemini with SkyStar USB 2 box for testing. It works fine. Noted a higher than expected CPU after doing so, and it was the Theater Manager from the DVBWorld install, so removed its startup using MSconfig. 14:50 UTC, Wednesday, 2011 Jan 26, week 04. Removed snow shield from the dish. The transparent plastic shield part had broken, leaving the flat support on the LNB arm, which tended to increase the likelihood of snow accumulating. Also sprayed the LNB and arm top with Teflon spray as recommended by Arne van Belle. Monday, 2011 Jan 24, week 04. Replaced the V2.3 SkyStar card in PC Stamsund with a V2.6D version, as Stamsund had been showing a higher-than-expected missed packet rate. Took a lot of the day to change this card as there were issues with the network card which I also tried to change. Reverted back to the PCI network card rather than use the on-board networking. Remembered to set the card speed down to 100Mb/s. Tuesday, 2011 Jan 11, week 02. Installed DVBWorld box onto PC Alta for EUMETCast test service. Monday, 2011 Jan 10, week 02. PC Molde removed from EUMETCast service. 07:00 UTC, Thursday, 2010 Dec 09, week 49. Both PC Gemini and PC Molde were moved, and so powered down for a period. Accidentally pulled the cable from the horrid F-connector on Stamsund during the move, so some data loss there. 09:40 UTC, Wednesday Dec 08, week 49. Large burst of missed packets from EUMETCast seen across Europe. These were so big that they would have swamped the normal data, so have been erased from the log files. 03:00 onwards UTC, Sunday, 2010 Nov 28, week 47. Heavy snow blocked the LNB and so signal loss. There was also a reduced signal strength period early yesterday morning from about 23:00 Friday 26 to 00:50 Saturday 27. More misery on Monday 29th - screen-shot and photo. 2010 Nov 16-17-18, week 46. USB box indication now provided from the same Dexatek box, but on PC Molde while PC Gemini is out of action with a broken chipset fan. 09:30 - 10:30 UTC, Thursday, 2010 Oct 14, week 41. Due to the electricity supply meter being changed, there was an enforced power-off during this period, and hence start-up glitches and apparent signal loss from the various PCs. The next day, I noted an increase in the disk usage on PC Stamsund, and perhaps this is caused by some old temporary files. TrimTree wasn't run regularly on that PC (but it is now!). Need to check tomorrow, and confirmed, on Gemini the existing TrimTree picked it up, and on Stamsund the added TrimTree tidied the extra data. Something like that is needed for the new 2.5.17 client PCs. Friday, 2010 Aug 27, week 34. Quite bad EUMETCast losses - two signal dropouts from Usingen, and multiple missed (and many not recovered) packets during the day, seen across Europe. Effects on the FSY size and tmp_directory size ( (TelliCast 2.4.4a and.2.5.17 clients respectively). 07:41 UTC, Friday, 2010 Aug 27, week 34. Restored Gemini to normal operation with Plane Plotter etc. 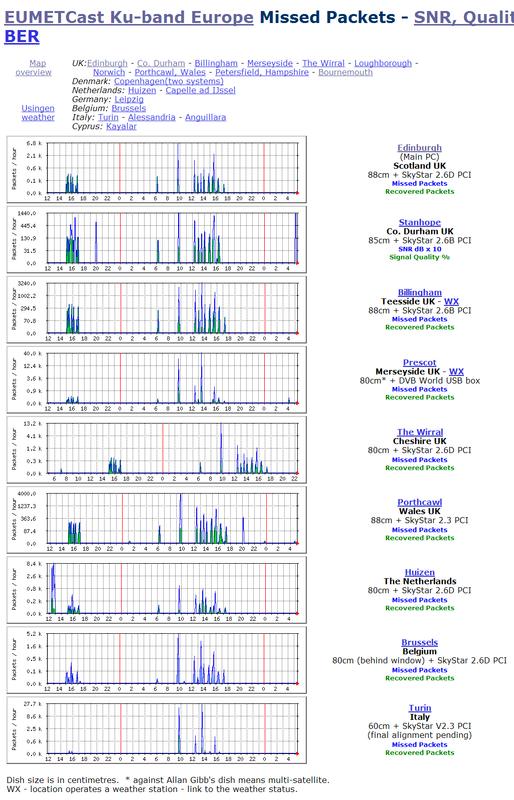 Too many external losses to make a good evaluation of small packet loss changes. 10:00 UTC, Thursday, 2010 Aug 19, week 33. As an experiment on Gemini, I have stopped all Plane Plotter related activity, to see what effect it might have on the missed packet rate. Will need to leave this off for several hours to make a judgement, possibly even a whole day. Not convinced it made any difference. 11:26 UTC unplugged the SBS-1 feed as well. 23:33 UTC, Tuesday, 2010 Aug 17, week 33. Critical dongle error on Hydra. 10:55 UTC, Tuesday, 2010 Aug 17, week 33. On PC Gemini, move tmp_directory back to HD in view of yesterday's events, but reformatted drive T: to be FAT32 rather than NTFS. Needed to shrink the partition to under 32GB. This resulted in a 69MB NTFS system overhead being dropped, visible in the disk usage graph. Monday, 2010 Aug 16, week 33. Europe-wide missed packets from EUMETSAT 15:00-18:00 UTC. 15:35 UTC, Thursday, 2010 Aug 05, week 31. Europe wide event (screen-shot) with high missed packet rate decaying over the next ~2.5 hours. PC Stamsund (MSG-1 & MSG-2 only) showed all 161 packets to be recovered. There was a high throughput peak at the time on the DVB USB box (no hardware PID filtering), but not higher than ones before or after. PC Stamsund showed a lower and flatter throughput from about 16:30 onwards, but that may not be related and may be just the lack of MODIS-L1 data. PC Gemini showed a large increase in the data in the tmp_directory and \received\ directories (on a scratch disk), decreasing from a maximum at 15:30 to nominal at 18:00. PC Stamsund (MSG-1 and MSG-2 only, but including the MODIS-L1 data on [Data Channel 4]) showed a lower and much flatter tmp_directory+\received\ usage between about 16:40 and 22:00. 13:08 UTC, Monday, 2010 Aug 02, week 31. Installed TelliCast 2.5.17 client on PC Stamsund, to almost-clean FAT32 partition, drive D:, excluded from mstDefrag. 07:50 UTC, Saturday, 2010 July 31, week 30. Installed TelliCast 2.5.17 client on PC Hydra, tmp_directory and \received\ tree on NTFS partition, drive T: excluded from mstDefrag. 11:10 UTC, Friday, 2010 Jul 23, week 29. Installed new (pre-release) TelliCast client on PC Gemini (chosen because of its higher missed packet rate). As EUMETSAT suggested, uninstalled the older TelliCast client first. Note that all files in the tc-recv.exe directory are deleted whether the install put them there or not! Make sure you have a backup! Kept the same recv-channels.ini configuration, and only changed the default EUMETSAT-supplied settings in recv.ini to: reduce the log to "quiet" level, include my existing error_restart script, and point the tmp_directory to RAMdisk. Changed the RAMdisk monitoring script to report the disk space used instead of the FSY file size (as there are no FSY files with the new client), and removed the "unscaled" option so that the natural maxima show more clearly. 07:15 UTC, Wednesday, 2010 Jun 30, week 26. Configured Hydra back to MSG-2+AVHRR+Metop operation as it was before April 29, week 17. From experience learnt during the tests, increased the RAMdisk from 350MB to 600MB, and put the tmp_directory on that RAMdisk, to see whether errors are reduced in this system configuration. Restarted tc-recv.exe at 07:30 to clear out errors during startup. MSG:2010-06-30 05:38:37.227:Log level is "normal". Noted that the FSY files were reused after the restart. 06:01 UTC, Tuesday, 2010 Jun 22, week 25. Restarted TelliCast on Stamsund with the tmp_directory back on the hard disk, just to see how well or how badly it performs. It seems that changing the network card speed was the major improvement. Left the RAMdisk at the same size in case we need to move tmp_directory back. 05:58 UTC, Sunday, 2010 Jun 13, week 23. Reset TelliCast on Stamsund so that the \received\ directory was back on hard-disk rather than on the RAMdisk. RAMdisk size left unaltered for now, as the tmp_directory is still on the RAMdisk. After a week, my impression is that this has changed the missed/recovered packet rate from near-zero to, perhaps, 0, 1 or 2 missed & recovered packets per day. This should not have any overall effect on TelliCast as it is able to recover the missed packets, but it does mean that TelliCast is having to work a little harder. Other externally-caused outages during this period make this conclusion rather less certain. Although I did at one stage think that the CPU for tc-recv.exe had increased after the change, it seems to be within the limits of the normal weekly variation. 17:25 UTC, Wednesday, 2010 Jun 09, week 23. Reduced the LAN speed on Gemini from "auto-negotiate" to 100Mb/s full-duplex, just to see whether it might affect the packet loss rate. No obvious effect - if anything a little worse. 10:40 UTC, Tuesday, 2010 Jun 08, week 23. Enabled DevCoCast-1 channel on Feenix and Gemini TelliCast, and on the respective MSG Data Managers, as folks are enthusiastic about some of the data there. 15:47-16:03 UTC, Sunday, 2010-Jun-06, week 22. EUMETCast outage due to bed weather over Usingen. Managed to reboot Feenix having installed the Windows updates. 15:38 UTC, Sunday, 2010-Jun-06, week 22. Altered network card speed on Stamsund down from 1Gb/s auto down to 100Mb/s full-duplex. Seems to have eliminated packet loss. 06:20 UTC, Thursday, 2010 Jun 03, week 22. Noted a slight difference in TelliCast throughput between Hydra and Stamsund, which are supposed to be identical at the moment. Found that the test PID (513) was still on Hydra, so removed it, and that Stamsund did not have [Channel-4] and [BMD-RA-VI] in recv-channels.ini, so commented those out on Hydra. 05:58 UTC, Wednesday, 2010 Jun 02, week 22. Restarted TelliCast on Gemini after adding an error_script just to log events. 03:40 UTC, Wednesday, 2010 Jun 02, week 22. On Stamsund seems to to have been a burst of missed packets lasting some 15 minutes. At 03:30 I had started collecting Crystal Symphony Web cams. 04:05..04:20 considerable increase in FSY file size. 08:55 UTC, Tuesday, 2010 Jun 01, week 22. Noticed that TheaterMgr.exe was still running, and using quite a bit of CPU (about 50% more than one MSG Data Manager!). Stopped it and removed it from the Runs key with sysinternals AutoRuns. The change may be difficult to see as the RSS is about to stop for two days, and that will drop CPU and throughput. 04:30 UTC, Monday, 2010 May 31, week 22. Disabled the Windows firewall on Stamsund, but it made no difference to the packet loss. 07:15 UTC, re-enabled the firewall and removed [channel 4] and [BMD-RA-VI] from the files received. No difference. 07:35 -08:45 UTC, stopped the NTP service for a test (as it was real-time) - no difference. 08:57 UTC, removed unneeded PIDs: 302, 509, 510 (leaving: 100, 300,301, 500). This reduced the reported throughput, but had no effect on lost packets. 15:40 UTC moved the entire \received\ directory from the hard disk to the RAMdisk, having made the RAMdisk now 600MB. 18:00 UTC restored the SkyStar PCI card, as there seemed to be no way to reduce the USB box losses. Even the receiver screen showed about 1 in 700 packets in error. 08:00-09:00 UTC, Sunday, 2010 May 30, week 21. Changed Backup PC Stamsund from using a SkyStar 2.3 card to using a DVBWorld USB box. Used the chance to install the latest Windows-7 Microsoft update patches. Left the SkyStar physically in place, but changed its IP address to .237 instead of .238. Needed to alter the MRTG quite a bit to use DVBreport.exe for the signal strength (will be a differently scaled graph - sorry about that - and for the changed network adapter numbers. Needed to update the usage monitor program to include the "DVB World.exe" program. May adversely affect timekeeping precision. This produced a much higher missed packet rate, so at 14:30-14:45 UTC I physically removed the SkyStar card and rebooted. Around 19:00 UTC, changed the logging from Normal to Quiet, but no obvious improvement. 15:30 UTC, Friday, 2010 May 28, week 21. Changed PC Hydra's EUMETCast and processing configuration to match that of Stamsund, to get comparative losses prior to perhaps making one of these PCs have its received data purely on RAMdisk. At the point of changeover, Hydra had two missed and two recovered packets since 05:55 UTC this morning (all PCs across Europe had seen a burst 06:00 to 06:10 UTC). PC performance screenshot across the changeover. 06:40 UTC, Tuesday, 2010 May 25, week 21. Increased Gemini's RAMdisk to 512MB, using the Gavotte RRAMdisk. This may have reduced the missed & recovered segments slightly, but no major change. 06:05 UTC, Thursday, 2010 May 20, week 20. Increased the size of Stamsund's RAMdisk from 300MB to 450MB, and in recv.ini, pointed tmp_directory => Z:\receiving\temp. This is an experiment to see whether the packet loss is reduced - we only expect the larger files to be stored in this temporary directory while being built up. Having reviewed eight days, my feeling is that this has made no difference eight way - neither better nor worse. 14:15 UTC, Thursday, 2010 Apr 29, week 17. Revised configuration on Test PC Hydra to be pure RSS in preparation for Section Packing test next week. 08:45 UTC, Tuesday, 2010 Mar 30, week 13. Updated SkyStar driver on Stamsund from 4.5.0a beta to 4.5.1. Wednesday, 2010 Mar 24, week 12. PC Hydra updated to 64-bit Windows-7, earlier statistics lost. Later, successfully installed the V4.5.1 SkyStar drivers and software (73MB download! ), and used the newer 28,672-byte B2Status.exe with the MRTG performance monitoring software. Thursday 2010 Jan 21 to Friday 2010 Jan 22. Arne van Belle noted a higher rate of Announcement Channel lost message reports, perhaps as a result of a EUMETSAT change. Some graphs are here. 14:20 UTC, Thursday, 2010 Jan 14, week 02. Added [SAF-Global] to all four recv-channels.ini files. 13:24:35.111 - 13:25:24.195 UTC, Monday, 2010 Jan 11, week 02. "Message lost" and "missed parts of file" reports on Stamsund. All four PCs saw non-recovered missed packets, reported at 13:25-13:30. Perhaps some melting snow fell from the roof onto the LNB? 06:40 UTC, Tuesday, 2010 Jan 05, week 01. Updated the FSY recording on PC Hydra to look for three .FSY files rather than two. This should allow for about 380MB total, and I hope we don't need to go bigger than that. 12:30 UTC, Sunday, 2010 Jan 03, week 01. More snow, perhaps this time due to snow falling from the house onto the antenna. It took longer to recover from this outage - a recovery of well over 12 hours and not finished as I write this. Signal plots for the period. 07:00 UTC, Sunday, 2010 Jan 03, week 01. Rebooted PC Hydra after security updates. 23:40 UTC, Saturday, 2010 Jan 02, week 01. Snow until about 01:30. Signal plots for the period. 07:00-07:30 UTC, Saturday, 2009 Dec 12, week 50. TelliCast had restarted on the main PC Feenix at 17:29 yesterday possibly due to a combination of large files, so took the opportunity to update: removed old ARSoft RAMdisk, installed recent Cenatek RAMDisk, set to 180MB, upped FSY file entry to 188,400,000 bytes, installed 29 security updates, rebooted, set Cenatek RAMdisk to use drive Z:, set drive Z: for sharing, restarted TelliCast. As this is the PC driving the 22KHz band-switch signal for the LNB is means that the other two PCs (Stamsund and Hydra) will have lost signal for a minute or so. Noted that the CPU increased on Feenix after the reboot - up from a 2-hour average of about 11% to 17%. Saw something similar from late May to early June, so not concerned about it. 09:42 UTC, Tuesday, 2009 Dec 08, week 50. Trials started of MODIS L1 data on [Data Channel 4], with files up to 89MB, which caused the FSY files on three systems to fill up (PC Hydra already had a full FSY file). Asked EUMETSAT whether this data might be placed on its own channel so that users of the hourly FSD data were not penalised. Screen-shot of the steps. 17:00 UTC, 2009 Aug 28, installed Windows-7 on PC Hydra. 10:00 UTC, 2009 Aug 17, installed Windows-7 on PC Stamsund. 09:30 UTC, Friday, 2009 Aug 07, week 32. Noted that TelliCast again lost connection to the Announcement channel. Replaced the 2.6D card in Stamsund with an older 2.3 card, which was still recognised by the drivers. Also changed the splitters so that the main PC was in sole DC control of the main LNB feed. ~13:55, 16:10 and 18:15, Wednesday, 2009 Jul 01, week 27. Signal strength dropouts due to heavy rain, causing missing data. The 45-second TelliCast error timeout was not triggered. ~14:50-17:40, Sunday, 2009 Jun 14, week 24. Signal strength reductions due to local thunderstorm activity (ice crystals in the clouds?) and heavy rain. The 45-second timeout for the TelliCast error script was not triggered. 11:23 UTC, Saturday, 2009 Jun 13, week 24. Short EUMETCast outage lasting about two minutes (11:23:40 - after 11:26:40). Rain and thunderstorm. Another at 13:55:04 - after 13:58:49 UTC. All three SkyStar cards and the Dexatek USB box lost lock. No action needed to restore the signal. During the first break, I had enough time to install pending security updates and during the second break just enough time to reboot the main receiver PC, Feenix. 17:20 UTC, Thursday, 2009 May 21, week 21. Noticed that PC Feenix spoke the time later than it should. Seemed to be something eating up memory almost to the maximum of 2464MB, and then reset to normal. Saw two TelliCast icons. Took the opportunity to install the security updates and reboot. Nothing in the Application event log. System event log for 18:19:14 had unexpected error on the RAMdisk, and this was /before/ the installation of the security updates. Last reboot was 13-Mar-2009, so some 69 days. 01:00 UTC, Tuesday, 2009 Feb 24, week 09. EUMETCast Ku-band switched from Eurobird-9 to Eurobird-9A. About two minutes net interruption. There are quite a few reports of signal strength changes in the MSG-1 self-help group, from this message onwards. Most are up in strength, with only those of us in bonny Scotland being down! Many folk are delighted, and the transition does seem to have been very smooth. Only one PC that I know of failed to re-connect to the new satellite. 06:42..06:50 UTC, Thursday, 2009 Feb 12, week 07. There was a short EUMETCast Ku-band break just before 06:00, and a longer outage from 06:42 to 06:50. Reports of a higher signal strength once the data returned. PCs Feenix and Stamsund were rebooted at 06:55 after installing security updates, and PC Feenix was set to the retune method of restarting. PC Hydra recovered its connection correctly, but PC Gemini with the Dexatek card did not (communication seems to have been lost between the Dexatek driver and the TelliCast software), and it was necessary to restart both programs to restore operation. Unfortunately, I didn't recognise this until about 11:30 UTC. 07:00 UTC, Friday, 2009 Jan 16, week 03. Restarted PC Hydra after a security update, and TelliCast didn't restart correctly, nothing in the log file, even with verbose logging. Found out (by running the V2.5.3 client) that it didn't like comments after the section name in recv-channels.ini, so "[DWDSAT] # data from DWD" is not acceptable! Reverted to V2.4.4B client. 07:00 UTC, Monday, 2009 Jan 12, week 03. Upped the RAMdisk on Feenix & Gemini to 127MB (max. possible, 150MB failed on Feenix, and gave only 127MB on Gemini). Was some disruption with the other EUMETCast PCs. 19:25 UTC, Tuesday, 2009 Jan 06, week 02. I observed a much higher than normal Missed Packets rate on TelliCast from 19:25 UTC yesterday on all PCs, lasting until about 20:15. There was a slight Ku-band signal strength reduction from 18:55, and considerable reduction since 20:25. The reduction was seen across Europe, to varying degrees, but was restore bat around 09:40 UTC on Wednesday. We had noted that it was a particularly cold night around Darmstadt. 06:30 UTC, Monday, 2009 Jan 05,week 02. As the FSY files were approaching the limit on both Feenix and Gemini, upped the RAMdisk to 150MB (157,286,400 bytes) and edited recv-channels.ini accordingly. These changes will only take place at the next reboot of each PC. Done for Gemini. 21:22 UTC, Friday, 2009 Jan 02, week 01. The TelliCast tc-recv.exe stopped working on Feenix, and appeared to have been restarted by the watchdog on Gemini. Hydra and Narvik were unaffected. I didn't notice Feenix until over an hour later, so I installed a set of pending security updates and rebooted. Was then OK, except that the CPU 2-hour average now seems to be nearer 10% than the 15% which has been over the last month. Can't explain this, as the throughput is unchanged. No other stations saw the same issue. The only common factor I can see is that both Feenix and Gemini are on the first output of a splitter from the LNB (but different feeds from the dual-LNB). 09:00 UTC, Wednesday, 2008 Dec 17, week 51. EUMETCast over Hotbird-6 was due to be switched off today. 07:38 UTC, Sunday, 2008 Nov 16, week 46. PC Stamsund started to give eToken-related errors (Failed to decode key, wrong interface address, etc.). Restarted at 1055 UTC. Noted that there had been a few of this type of error before: a few every day up to Oct 29, then a few every day from Nov 12 onwards. A simple restart didn't fix it (no licensed data flowing), so cold reboot at 11:25. Now seems OK.
1000 UTC, Friday, 2008 Nov 14, week 46. PC Feenix replaced PC Hermes as the main EUMETCast receiver. For continuity's sake, I carried over the old MRTG data from Hermes. Removed the amplifier and splitter from Hydra, so that should be restored to its exact previous configuration. Data for the period Wednesday - Friday will be different (and lower, it appears). 14:46 UTC, Wednesday, 2008 Nov 12, week 46. Added a 13-18dB amplifier and a 4-way splitter to feed to the Test PC, Hydra. This to allow build of a replacement PC for Hermes whose CPU fan is now very noisy, and which is is showing disk errors. 11:00 UTC, Tuesday, 2008 Nov 11, week 46. Switched EUMETCast from Hotbird-6 to Eurobird-9, seeing slightly improved signal and SNR. 11:35 UTC, Wednesday, 2008 Nov 05, week 45. PC Stamsund spontaneously rebooted. Nothing in the event log. As TelliCast had been restarted, took the opportunity update the SkyStar database here as well. 10:05 UTC, Wednesday, 2008 Nov 05, week 45. Updated PC Hydra with the SkyStar HB6/EB9 database. Caused slight glitch in service when the database was "Restored", and a further glitch when I ran TransEdit just to check it worked. 07:30 UTC, Wednesday, 2008 Nov 05, week 45. Added SNR monitoring to the main PC, Hermes, in anticipation of the change of satellite to Eurobird-9 tomorrow. Saturday, 2008 Nov 01, week 44. Various tests: (a) to confirm skew direction: when looking towards the satellite, satellites to the east such as Astra (and Hotbird-6 and Eurobird-9 from Edinburgh) will appear tilted anti-clockwise, and this is the direction to which the LNB should be set when looking towards the satellite. The lead should come out at the "5 o'clock" position rather than it's default position of straight-down (6 o'clock). The final position should be tweaked carefully for best quality. (b) found that I could receive Hotbird-6 in Edinburgh on a 35cm portable antenna with careful adjustment. Changing a 0.6dB LNB for a 0.2dB unit resulted in an increase of signal quality from 52% to 55%, while the signal strength remained unchanged ay 70% (Dexatek DVB box and 32-bit drivers on Windows Vista). (c) to discover that I could actually receive Eurobird-9 on 11977MHz using this new Silver Tech Inverto 0.2dB LNB, although the alignment of azimuth, elevation and skew was very critical to get a stable signal. Note that exactly what 0.2dB means is uncertain - an average value over the frequency and band range, a best value, only at one optimum temperature etc. etc. The same may apply to the 0.6dB figure as well! Caveat Emptor. 1630 UTC, Thursday, 2008 Oct 30, week 44. Upgraded the SkyStar drivers to V4.5.0 on the backup PC (Stamsund) in an attempt to reduce the DPC latency and error rate. Noted that the V4.4.1 drivers which work fine on Hydra (XP SP2) refuse to load on Stamsund's XP SP3. However, the SNR/Quality on the MRTG monitor were occasionally reported as zero (you do need the newer 28,672-byte B2Status.exe), so I tried swapping the order of the BER and SNR/Qual calls in the MRTG list. DPC results. 0600 UTC, Wednesday, 2008 Sep 03, week 36. Turned off EARS-AVHRR on the backup PC (Stamsund), as it's not processed there, and is already on at least two other PCs. 1540 UTC, Tuesday, 2008 Aug 26, week 35. Arne suggested trying Zone Alarm with 192.168.238.238/255.255.255.0 in the trusted zone, I restored ZA on Hydra with that setting. However, any Zone Alarm activity does increase missed packets, so decided to leave ZA disabled on that PC (which is not used for routine interactive work). 1250 UTC, Monday, 2008 Aug 25, week 35. As an experiment, turned off the Zone Alarm firewall on PC Hydra to see how much reduction there might be in missed packets before FEC etc. Present values about 126 packets/hour lost, and 2 packets/hour recovered. Late Tuesday night, 2008 Aug 19, week 34. System HD on Hermes failed, so rebuilt Hermes the next morning (Wed 20). Noted that the CPU load and missed packets before FEC was quite a lot lower, as there was no defrag, anti-virus or Firewall software installed. At 04:39 UTC on the 21st, installed mstDefrag software, and did notice an increase in the CPU used from about 8% to about 12% (1GHz Pentium III). It had been about 16% average CPU before. Had been about 5 packets/hour missed with all three running, now just 1 packet/hour or less. 1750 UTC, Saturday, 2008 Jul 19, week 29. The uplink of the EUMETCast service suffered a brief rain outage, and whilst this didn't trigger the automatic restart scripts, it did trigger a timing glitch on two out of three PCs (Hermes and Stamsund). Wednesday, 2008 Jun 25. Added CMA data stream to main PC (Hermes) and backup PC (Stamsund). It's about a GB per day. 2205-2245 UTC, Monday, 2008 Jun 02, week 23. Signal drop and loss (22:10, 22:20 and 22:24 UTC) possibly due to bad weather at the Usingen uplink station. 2106 UTC, Tuesday, 2008 May 13, week 20. Meteosat-9 safe mode triggered, so Met-8 Rapid Scan suspended and main service reverted to MSG-1 (Meteosat-8). Normal service, including rapid-scan, restored Monday, 2008 May 19. 0900 UTC, Tuesday, 2008 May 13, week 20. Rapid Scan Service on Meteosat-9 released to users. 1300 UTC, Tuesday, 2008 May 06, week 19. Rapid Scan Service on Meteosat-9 released to manufacturers. 0800 UTC, Monday, 2008 May 05, week 19. Start of main MSG-2 data processed to effective radiance and not spectral radiance. Parallel dissemination of MSG-2 data processed to effective radiance ended. 0800 UTC, Tuesday, 2008 Apr 29, week 18. Parallel dissemination of MSG-2 data processed to effective radiance started. Sunday, 2008 Mar 02, week 9. Noticed some files named: E6D02290000030400001. These have an invalid file name, as 2006 did not have 28 days in month 02. Could be renamed to E8D02290000030400001 for correct processing. 1649-1723 UTC, Tuesday, 2008 Feb 26, week 9. EUMETCast signal loss on PCs Gemini, Hermes, Hydra and Stamsund. The signal strength indicator on Gemini stayed at 69%, but was red. When the antenna lead was removed it dropped to zero. Normal operation has a yellow-green, and not a red, background. 0919 UTC, Monday, 2008 Feb 25, week 9. Was informed by EUMETSAT that they don't use PID 502, so removed it from the Vista PC (Gemini). 1550 UTC, Saturday, 2008 Feb 23, week 8. Noticed intermittent red T-icons on Hermes when doing other work. The log file was full of failures to connect to the DWDSAT channel, which is on PID 302. But when comparing Hermes and Gemini, it was PID 502 which was missing from Hermes, and that's not listed on the EUMETSAT web-site list. Perhaps PID 302 got lost in the glitch on Feb 13? Looks as if the act of adding PID 502 into Hermes (what data?) has also restored PID 302 to being active. 1357 UTC, Wednesday, 2008 Feb 13, week 7. EUMETCast glitch caused restarts on Hermes, Hydra and Stamsund. Noted about 400MB/day less throughput on Hermes compared to Gemini after that, and they were identical before. Why? 0700 UTC, Friday, 2008 Feb 15, week 7. Power-off reset of Stamsund. The	SkyStar2 PCI card now reports a lower signal level by about 1.25dB. "Stable 2" condition! 1100 UTC, Saturday, 2008 Jan 26, week 4. Had occasion to reboot Stamsund and found the reported signal level jumped by 1.5dB and quality by 8%. The actual signal was completely unchanged (as reported by Hydra). Now it's Hydra 7.3dB 58%, Stamsund 7.1dB 56%. So much for consumer-level products! 1230 UTC, Monday, 2007 Dec 31, week 53. Replaced SkyStar V2.3 card in Stamsund with V2.6D card, both to reduce the heat and to provide more meaningful signal comparisons. 1700 UTC, Tuesday, 2007 Dec 25, week 52. PC Stamsund (backup PC) power-supply fan stopped working. New PSU purchased from Maplins on Boxing Day (26th) and operation restored at 11:30 UTC. ~0815 UTC, Tuesday, 2007 Nov 27, week 48. TelliCast Web service on Test PC Hydra seemed to stop working. Windows updates installed (including MS IE 7) and PC rebooted at 0615 the next day. 1725 -1737 and 2012 -2034 UTC, Tuesday, 2007 Nov 13, week 46. power outage. 1420 UTC, Wednesday, Nov 07, week 45. Step increase in signal strength and quality across Europe. About 1dB in signal strength and 5% in quality. 1610 UTC, Tuesday, Nov 06, week 45. Possible small step drop in signal strength. 05 - 1.0dB, and slight quality reduction. Seen across Europe. 1415-1640 UTC, Tuesday, Nov 06, week 45. 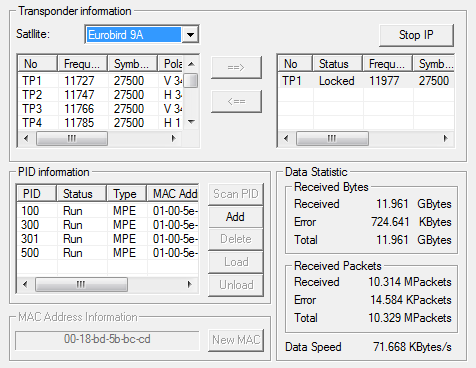 Although the signal strength remained steady at its reduced level, the backup PC Stamsund showed a very high missed packet/recovered packet rate, and hung at 1640. Is the card on its way out? 0721 UTC, Monday, Oct 29, week 44. eToken error on Stamsund (backup PC). Could not restart as the Web server port wasn't released (and so still in use). Logged out and back in to restart OK at 18:00. ERR:2007-10-29 07:21:43.212:Critical dongle error (eToken transaction timed out). Restarting child. 0340 UTC, Sunday, Oct 28, week 43. Sharp dip in signal strength seen on backup and test PCs, with degradation on either side of that time. There was high wind here overnight, and perhaps rain. Nothing seen across the rest of Europe. Slight data loss on the Backup PC (Stamsund, V2.3 card) but nothing on the others (V2.6 cards). 2345 UTC, Monday, Oct 22, week 43. Break in EUMETCast from 2345-2359, and 0029-0042 (Tuesday 23). On Hermes and Hydra, the timekeeping suffered a glitch as well. 0137 UTC, Saturday, 2007 Oct 20, week 42. Breaks in EUMETCast at 01:37:49 - 02:39:49 (Hermes), 01:37:54 (Hydra), and 01:38:00-02:39:49 on Stamsund. On Hydra, the PC rebooted (with nothing in the event log), and on Stamsund, Server4PC.exe "encountered an error". It looks as if the signal now is at reduced strength and therefore reduced quality. However, Europe-wide the strength and quality look OK. Rebooted Hydra again to try and restore the correct signal strength reading. Tuesday, 2007 October 16, week 42. More uplink events. Signal breaks at: 13:39:44 UTC and 13:44:10 (Hermes), 13:39:44 and 13:44:10 (Hydra), and 13:39:45 and 13:44:10 (Stamsund). BER and SNR look to be back to normal after that. 1130 UTC Monday, 2007 Oct 15, week 42. T-Systems switched the entire Ku-band uplink to a redundant antenna. The BER went down to almost nominal levels, and the signal level returned gradually to near normal over the next few hours (some "noise" on the SNR graph from Stamsund until about 18:00). The switch resulted in small breaks being reported: on Hermes and Hydra at: at 11:31:03 UTC, so the break at 11:30:33 (30-second TelliCast LOS timeout). Remarkably, no data was lost as a direct result. 1300 UTC, Friday, Oct 12, week 41. Large signal strength drop noted by V2.6 cards throughout Europe. Two short periods of normal strength at around 1900-1940 on Friday 11th and around 0430-0530 on Saturday 12th. Afternoon, Thursday, 2007 Oct 11, week 41. The BER observed on the backup PC started to increase, and had reached a sustained level of about 10^-3 (one in a thousand) by about 0200 on Saturday, Oct 13. I believe this higher BER to be due to interfering signals from the satellite, but that the lower signal strength reported above makes the effect of this interference far worse. 1845 UTC, Sunday, 2007 Aug 19, week 33. EUMETCast strength glitch seen throughout Europe - probably weather-related. Triggered a restart on my older V2.3 card PC. There was a BER spike at 0545 UTC on Aug 19, and an increased BER level from 1030 UTC onwards until 1030 UTC on August 20. 1100 UTC, Wednesday, Aug 08, week 32. A sudden increase in signal level noted on SkyStar V2.6 cards across Europe, and a drop in BER to zero on my own SkyStar V2.3 card. Something changed at the uplink or on the Hotbird-6 satellite. What? 1600 UTC, Monday, Aug 06, week 32. The higher BER noted on Saturday Aug 04 seems to have reverted to its previous level. See: comparison for the current graphs. Later: I heard from EUMETSAT that they found a performance problem in the Channel "EUMETSAT Data Channel 2", which also caused longer than usual delays on channel 2 and some other channels. The problem was corrected yesterday around 16:30. No parameter change, just a reset of the server application. Saturday, Aug 04, week 31. At about 0230 UTC the missed packets and, perhaps, the recovered packets, seems to become somewhat worse on the test PC Hydra. This co-incided with the return of the IASI data. The IASI files appear to be about the same size, though, so I would not expect an increase. The same effect was seen on the main PC from about 0330 UTC, although it does not take the IASI data (but it does take Metop AVHRR data). See: comparison for the actual graphs. 2006 UTC, Tuesday, Jul 31, week 31. TelliCast on Hermes stopped. eToken transaction timed out. Event Viewer showed "Smart Card Reader 'AKS ifdh 0' rejected IOCTL 0x310014: The semaphore timeout period has expired." 2140 UTC logged out and back in to Hermes, seemed to restart TelliCast OK. This stopped some of the MRTG collection for a period. 1146-1149 UTC, Friday, Jul 20, week 29, EUMETCast drop-out triggered TelliCast restarts on all three PCs. Drop-out was slightly longer on the older V2.3 card on Stamsund, 1144-1150 UTC. NTP transients triggered on Hermes and Hydra. 1811-1813 UTC, Tuesday, Jul 10, week 28. EUMETCast drop-out triggered restart on Stamsund. Other PCs handled the loss OK.
1430 UTC, Friday. Jun 29, week 26. Seems that Hermes may not have properly recovered after the Jun 21 crash, as the T-icon was intermittently turning red, there were error messages about joining the DWDSAT channel, and there was less DWDSAT data than expected (only about 100MB/day instead of 750MB/day). Couldn't stop and restart the TelliCast client (Web server address not released), so rebooted Hermes. DWDSAT PID may have been lost across the restart. 0900 UTC, Wednesday, Jun 27, week, 26. MSG-1 Rapid Scan data restarted. 0900 UTC, Monday, Jun 25, week 26. MSG-1 Rapid Scan data stopped. 0317-0325 UTC, 1141-1146 UTC, Thursday, Jun 21, week 25. Rain-storms at Darmstadt caused EUMETCast signal outage. 0915-0950 UTC, Wednesday, Jun 20, week 25. TelliCast fell over on Hermes with an: "eToken transaction timed out, Critical dongle error (eToken transaction timed out). Restarting child, EToken thread does not terminate. So took the opportunity to install all the Microsoft Update patches and update the anti-virus software to a new version. 1517-1524 UTC, Thursday, Jun 14, week 24. Rain-storm at Darmstadt caused EUMETCast signal outage. 1400 UTC, Wednesday, Jun 13, week 24. MSG-1 rapid-scan data halted (seen on Backup PC Stamsund). 1304 UTC, Wednesday, Jun 13, week 24. IASI data halted (seen on Test PC Hydra). 1659-1703, 1708-1711, 1723-1735 UTC, Sunday, Jun 10, week 23. Rain-storm at Darmstadt caused EUMETCast signal outages. 1317-1335 UTC, Saturday, Jun 09, week 23. Rain-storm at Darmstadt caused EUMETCast signal outage. 0615-0745 UTC, Tuesday, Jun 05, week 23. Power glitch at Darmstadt took out everything except DWDSAT. 0955 UTC, Friday, Jun 01, week 22. MSG-1 rapid-scan data started (seen on Backup PC Stamsund). 1926 UTC, Saturday, May 26, week 21. Signal outage/dropout 1925-1935 caused repeated restarts on Stamsund, two separate restarts on Hydra (at 1926 and 1929), and no effect on Hermes. Note that Hermes is fed via a single splitter, and Hydra and Stamsund via two splitters and so will have a lower signal strength. 0015 UTC, Saturday, May 26, week 21. Signal outage/dropout 0014-0019 caused restarts on all three PCs. 1300 UTC, Thursday, May 24, week 21. IASI data added to Test PC. Increased data throughput, of course, plus increased missed data packets and recovered data packets. 1000 UTC, Thursday, May 10, week 19. MSG-1 data dissemination halted. 1900 UTC, Tuesday, 2007 May 01, week 18. Considerable disruption to EUMETCast services causing reduced data volumes and hence reduced missed FEC data. 2007 Apr 11. MSG-2 replaced MSG-1 as the primary satellite. ~1240 UTC, Thursday, 2007 Feb 08, week 6. About 2dB dip in SNR lasting abut 30 minutes, centred on 1240. ~0930 UTC, Wednesday, 2007 Feb 07, week 6. SNR dip of about 1.5dB, worst at 0930, visible from about 0700 - 1400. ~2235 UTC, Sunday, 2007 Feb 04, week 5. TelliCast fell over on Stamsund, taking the TelliCast logging (and hence MRTG) down on Narvik. 0820 UTC, Thursday, 2007 Feb 01, week 5. There was another glitch which caused a timekeeping step on the Test	PC, and required an NTP restart on the main PC. This seemed to coincide with a slight increase in signal quality and SNR as recorded by the Test PC (0.5dB SNR and 2-3% quality). 07:50 UTC, Thursday, 2007 Feb 01, week 5. Test PC (Hydra) lost EUMETCast connection for more than 90 seconds. 0424 UTC, Friday, 2007 Jan 19, week 3. EUMETCast drop-out triggered restart event on Hermes. Hydra timekeeping affected. 1750-1820 UTC, Thursday, 2007 Jan 18, week 3. EUMETCast drop-out on all three PCs. 19 red Server4PC icons visible on Stamsund 20 on Hydra..
0415 UTC, Monday, 2007 Jan 01, week 1. Sudden and deep drop of EUMETCast signal strength all over Europe. Automated restart not triggered (90s signal timeout). ~1520-1525 UTC, Sunday, 2006 Dec 31, week 52. PC Hydra time was off, due to a drop in signal strength. Heavy rain and hail. Suspect the card must have come near to loss of signal. but not quite. The 90-second LoS TelliCast timeout was not triggered. Hermes timekeeping also off. Restarted NTP on Hydra & Hermes. 0200 UTC, Friday, 2006 Dec 15, week 50. EUMETCast seemed to drop out on Hermes and Hydra, but OK on Stamsund (older V2.3 card). Required a manual restart on those two PCs. NTP consequently affected. Two more drops at 20:47 and 21:53, handled by automatic restart on Hydra. Hermes didn't have automatic recovery and didn't re-lock, so some data loss. Stamsund (V2.3 card) unaffected. Added automatic restart to Hermes and Stamsund. 0200 UTC, Wednesday, 2006 Dec 13, week 50. EUMETCast seemed to drop out on Hermes and Hydra, but OK on Stamsund (older V2.3 card). Hydra also showed a drop from 10:00 to 11:00 (from about 9dB to 7.5dB). NTP also affected. 1810 UTC, Sunday, 2006 Dec 03, week 48. Upped FSY file on Hermes to RAMdisk 95MB, FSY size 99,000,000. Not tested with a reboot. Later restored to 80MB, 83000000 for safety, that's what's working right now, so leave it! ~22:30 UTC, 2006 Nov 29, Wednesday, week 48. Glitch on EUMETCast caused PC Hermes and Hydra to stop collecting. Needed to restart by selecting EUMETCast in Setup4PC. Stamsund (V2.3 card) recovered by itself. tmp_directory=temp in the [parameters] section of the recv.ini file. I noticed that the 28MB EPS global AVHRR files could take anything up to 30 seconds to build up. 0155 UTC,2006 Nov 27, Monday, week 48. Glitch on EUMETCast stopped Hydra and Hermes reception. Hermes (V2.6D card) responded to a right-click, select EUMETCast, but I decided to reboot Hydra as it was in need of Windows XP security updates in any case. 1200 UTC, 2006 Nov 23, Thursday, week 47. Added BER/SNR/Quality reporting on Hydra. 1043 UTC, 2006 Nov 22, Wednesday, week 47. Glitch on EUMETCast (?) stopped Hydra working, but Hermes and Stamsund carried on. Some segment loss on the 1030 HRIT. 0936 UTC, 2006 Nov 22, Wednesday, week 47. Added DWDSAT to Hermes. 0130 UTC, 2006 Nov19, Sunday, week 46. Timekeeping glitch on Hydra suggests EUMETCast transient. 1440 UTC, 2006 Nov 17, Friday, week 46. Stamsund rebooted after security updates. 1210 UTC, 2006 Nov 16, Thursday, week 46. Stamsund showed a period of non-zero BER between two SNR glitches (12:10 and 13:40 UTC). 0700 UTC, 2006 Nov 08, Wednesday, week 45. Hydra rebooted to pick up pending security updates. 2010 UTC, 2006 Nov 07, Tuesday, week 45. Missing segments on PCs Hermes and Stamsund, and red satellite icon on Hydra. Could restart satellite reception by right-clicking the Server4PC icon and selecting "EUMETCast Hotbird 13E". 0140 UTC, 2006 Nov 02, Thursday, week 44. Seemed to be a timekeeping glitch on both Hydra and Hermes, so I suspect a EUMETCast glitch around this time. Another glitch at about 06:05. 1145 UTC, 2006 Oct 26, Thursday, week 43. BER on PC Stamsund dropped back to zero. Nothing was changed at this end. Something on the satellite or uplink? From about 16:00 UTC the SNR became slightly higher. but slightly more variable, and there were some corresponding slight increases in signal quality as well. Will need to watch this carefully in case it's a developing fault this end. Just realised that it was quite windy on Thursday afternoon. A co-incidence? 0015 (clock), 2006 Oct 24, Tuesday, week 43. PC Stamsund recorded very high peaks just after midnight local time. Some missing segments, but only on Stamsund. Recorded BER (MRTG entries average/maximum for period 2315 UTC 33593/35865, 23:20 UTC 2503/35865, 23:25 UTC: 24/248). As the signal strength remained normal, I can't explain the very high BER (except perhaps by very high CPU load). TelliCast FSY file stayed the same size (16.037MB). Nothing in the event log. No missing MSG-2 data. MSG-1 missing 2315, ch. 1..11 seg 2, ch. 12 seg 6 & 7. Raw data edited from MRTG log file: 1161645900 0 24 0 248, 1161645600 0 2503 0 35865, 1161645300 0 33593 0 35865. Left some trailing BER values. This at least allows the rest of the more subtle BER to be seen! Later - Arne van Belle reported a drastic drop in signal at the same time, although no BER. So I restored the edited entries to the MRTG plot, but with the values limited to 100. 1000 (clock), 2006 Oct 10, Tuesday week 41. EUMETCast reverted to normal MSG-1 and MSG-2 operation, so the backup PC should show approximately twice the throughput. 0910, 2006 Oct 10, Tuesday week 41. Stamsund spontaneously reboot during a period of high network activity, so there is a small outage shown. 0500 - 0630, 2006 Oct 04, Wednesday, week 40. Local power cut. On restoration of PCs, all were showing red (no signal), until I unplugged the LNB form the splitter for a few seconds. Hermes now showing lower strength than before (59%, 7.3dB) but figures recorded on Stamsund seem OK.
0950, 2006 Oct 02, Monday, week 40. LNB re-adjusted (using the second output via an extension cable). Reading on Stamsund 64% 8.5dB, reading on Hermes now 8.8-9.1dB 66-68%. 1030 - 1200, 2006 Sep 25, Monday, week 39. Reception interruption due to antenna mounting, LNB and snow-shield upgrades. Some heavy rain in the afternoon as well! 1145 - 1545, 2006 Sep 21, Thursday, week 38. Reception interruptions due to people working near the antenna. 1023, 2006 Sep 18, Monday, week 38. Added DWDGDS to test PC (Hydra). Don't know what the daily data throughput is expected to be. 1030, 2006 Sep 16, Saturday, week 37. Added GEONETCast (Americas-CH1) to backup PC (Stamsund). As there were some large files (almost 32MB) the FSY file increased from 16MB to 49MB. 1735, 2006 Sep 13, Wednesday, week 37. Backup PC and BER collection (Stamsund) rebooted. Noted that XP was trying to run System Restore on Z: (but failing), so need to add the registry entries to prevent this. ~0600 UTC, 2006 Sep 13, Wednesday, week 37. BER suddenly went to zero (as measured on the backup PC), thus possibly ending the problem which began on August 25. 1404, 2006 Sep 12, Tuesday, week 37. Noticed a momentary, red TelliCast icon on the main PC (Hermes). Network ID now showing when tested on the backup PC (Stamsund). Still non-zero BER on backup PC. 0715, 2006 Aug 26, Saturday, week 34. Rebooted test PC, and the reported signal level increased to 54% and 6.8dB. There was no actual change, though, so the indication is plain wrong. 07:30 rebooted Stamsund to see if this non-zero BER would go away. It didn't. 0830-0856, 2006 Aug 25, Friday, week 34. Hotbird-6 signal loss. Both Stamsund and Hermes NTP became confused while the red satellite icon was showing. Installed the security updates on Stamsund and Hydra, and rebooted both. Last good file was time stamped 07:30:38 and first good file 07:56:45. Noted a non-zero BER on Stamsund after the event, and the signal level was reported as low on Hydra (40%, 4.4dB), dipping into the yellow. 0030-0300, 2006 Aug 13, Sunday, week 32. Data loss due to power cut. 1000-1900, 2006 Aug 07, Monday, week 32. PC Stamsund rebuilt with Windows XP Pro. 1456-1522, 2006 Aug 03, Thursday, week 31. PC Stamsund was down for maintenance. Memory upgraded from 1 to 3GB, and thoroughly cleaned! The SNR and BER figures will plot as constant during the outage, which is not unreasonable. 2006 Jul 23, Sunday, week 29. Three brief dropouts during the period 19:00 - 20:30 UTC. Bad weather at the Usingen uplink station may have been the cause. 2006 Jul 09, Sunday, week 27. Today showed the maximum throughput of EPS test data (graph here). During the 24 hours up to 0600 UTC Sunday morning, the measured throughput on the DVB (as found on the TelliCast Statistics page) was 38.7GB, and 40.0 GB of EPS data files were received. There was also 11.0GB of Data Channel 1/2/3 etc. data throughput, so the total data received must have been at least 51GB (40.0+11.0). As the TelliCast system can include data compression, this may account for more data being received (51GB) than the throughput shows (38.7GB). The maximum 1-day average as shown by MRTG was 502kB/s, which is 41.3 GB/day, and this would have been the throughput for Sunday, July 09. During Sunday (UTC+1), 38.4GB of EPS data files were received, so the actual data received (49.4GB) again exceeds the throughput (41.3GB). Because of the averaging in MRTG, it's possible that the actual 1-day value was higher, so this may be a little misleading. 1600, 2006 Jul 05, Wednesday, week 27. Rain prior to a thunderstorm caused a signal drop-out between about 1500 and 1530 UTC, and messed up NTP timekeeping on Hermes and Hydra. Stamsund was OK. All PCs retained signal lock without any intervention. 2006 July 03, Monday week 27. Saw one peak on the EPS test PC of average 5 minute rate 911.2kB/s, and a TelliCast HTML Shell peak of 20.3Mb/s. Maximum 5-minute peak on Tuesday was 988.5kB/s. 2006 Jul 02, Sunday, week 26. Some short, sharp thunderstorms this morning produced signal drops and BER increases, but no missing segments. However, a storm at 1500 clock resulted in a signal loss from about 14:45 to 1458, with the indicator in the red. Gradual recovery from 1500 clock onwards. Took the opportunity to apply security updates to Stamsund. 0800 clock, 2006 Jun 30, Friday, week 26. High rate data tests today - so far highest seen is 10.6Mb/s (from TelliCast shell overview). 1630 clock, 2006 Jun 29, Thursday, week 26. Since 1800 clock yesterday, the test PC hasn't missed a single LRIT or HRIT segment, just one DCP/WMO message. Looks as if the USB box is coping OK, as EPS/AVHRR data has been flowing. But there have been some EPS/AVHRR files noticeable smaller than most, so perhaps it is the EPS/AVHRR data which is suffering? Closer inspection showed that all files received were the same size as those on Arne van Belle's system, but that for the first couple of hours after starting yesterday, some of the AVHRR files were simply missing. From 1542 to 1745 UTC, June 28, Arne's system saw 45 EPS/AVHRR files, the USB system saw only 32 files. All but one of the missing files was before I restricted the data to just channel EPS-10, so probably caused simply by data overload.. Restored test PC to PCI card and full EPS data flow. 1800 clock, 2006 Jun 28, Wednesday, week 26. When AVHRR EPS data started flowing, missing segments started to appear (mostly but not entirely in the faster HRIT data), so I commented out all EPS channels except the AVHRR data (EPS-10), to see how well the system could them cope. This simulates the load from a user taking MSG-1, AVHRR regional from NOAA-17/18 and AVHRR global from METOP. 1030 - 1100 clock, 2006 Jun 28, Wednesday, week 26. Removed DVB PCI card from Hydra (the test PC) and replaced with older USB box from John Tellick. Needed to add USB driver, and force correct IP address. This is to test if the USB box (and its 12Mb/s maximum connection) can handle the data from EPS as well as the normal MSG-1 and AVHRR data, without disruption of MSG-1 and AVHRR reception. The peak rate seen so far through the USB box has been 7.2Mb/s, monitored on the TelliCast HTML shell, and no missing segments. Later data rate peaks of up 9.8Mb/s did result in missing segments, though. 1800 & 2300 UTC, 2006 Jun 25, Sunday, week 25. Thunderstorms in Germany cause signal outage. PCs automatically recovered (although NTP timekeeping was affected). 2200, 2006 Jun 18, Sunday, week 24. Some sort of TelliCast glitch again. A few missing segments. Upset NTP timekeeping on both Hermes and Hydra. ~1100, 2006 Jun 17, Saturday, week 24. Signal loss and re-acquisition on Hermes. 2000-2400, 2006 May 27, Saturday, week 21. Backup PC rebooted a couple of times to convert C: from FAT to NTFS. 2006 May 19 - 2006 May 22, Friday - Monday, week 20-21. Data collection stopped due to main PC lockup. Data from backup PC was substituted. 1000 clock, 2006 May 13, Saturday, week 19. Added splitter in the feed to Stamsund so that it is now at least 6dB down on full signal. Very difficult to discern any change in quality or SNR. 3rd feed now available for a test PC (Hydra) with SkyStar V2.6D. Hydra statistics started Monday May 15, but will be intermittent. 0941 clock, 2006 May 13, Saturday, week 19. EUMETCast down from 0841 - 0908 UTC. 0700 clock, 2006 May 12, Friday, week 19. PC Stamsund rebooted for security update. 1800 clock, 2006 May 02, Tuesday, week 17. Updated TelliCast client on Stamsund to V2.4.4 B. How were these results plotted? I use MRTG to monitor my networks on Windows 2000, XP, Vista and Windows-7 (32- and 64-bit). I suggest that you first set up MRTG to show the network throughput on your system, using the instructions on the MRTG Web pages. If you are using Windows Vista or Windows-7 you may first need to install and enable the Windows SNMP component. Define a directory for the output HTML and PNG files from MRTG, and use the command "perl cfgmaker public@<pc-name>" to establish your basic MRTG configuration file. Note also that you will need to create the LogDir, HtmlDir and ImageDir folders yourself - MRTG doesn't do it for you. These directories are where the summary log files, the HTML output, and the PNG image output are stored. The HTML and PNG output make up the graph pages you have seen above. 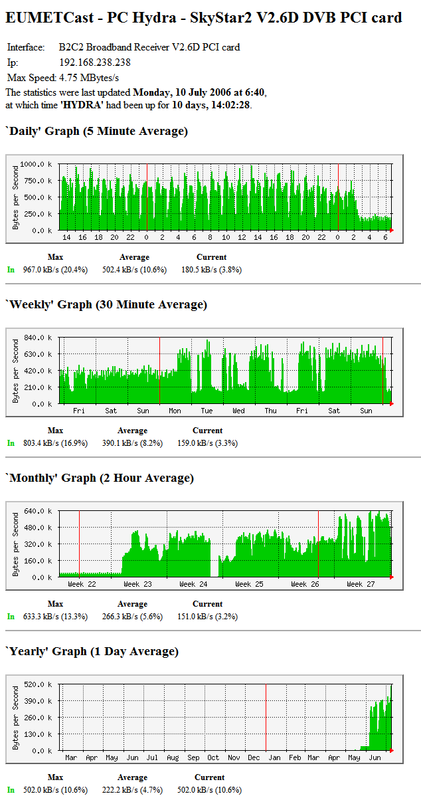 You can use MRTG for monitoring other information such as CPU load, disk usage, air temperature and even cable modem signal levels. To show throughput, SNMP (Simple Network Management Protocol) also needs to installed on the PC as part of the Windows Networking components (it's on the Windows CD). To install SNMP, Control Panel, Add/Remove Programs, Add/Remove Windows Components, check that Management and Monitoring Tools are selected. Note that on Windows-7 and Vista, where the security is a little tighter, you may need to add the "public" to the Services, SNMP, Properties, Traps communities, and add "public" with READ ONLY access to the Security settings. My thanks to Andrew Hall for reminding me about this possibility. Andrew runs MRTG as a service, I run it from a shortcut in the Startup folder. You can also use MRTG to plot a variable which can be obtained from the command-line by running a program which writes it results to "standard output", i.e. a normal command-line output. I used the B2status.exe program from the B2C2 SDK which can return a snapshot of the status of the DVB card. Please be aware that the version of B2status.exe in some SDK versions does not work, so there are earlier and later copies here in B2satus.zip. Please use the version appropriate for your drivers - the V4.4.1 version also works with V4.5.1 (and, I hope, 4.6.0) software. You will need to copy this program to the MRTG "bin" directory, so that the MRTG script can find it. The B2status.exe program can take command-line parameters to limit the displayed data, so I run this with the -TI parameter. The first line of the Perl script below invokes the command, and processes the output from the program into a four-line response as required by MRTG. There are three separate scripts - one to get the Quality and SNR, one to get the BER, and one to get the "Strength" for drivers V4.4.1 and later. To make the values sensible integers for MRTG to plot, the SNR is scaled by 10 so that both it and Quality become values in the range 0..120 (at least on my system), and the BER is scaled by 1E6 so that it becomes an integer "parts per million" value. Note: it appears that using such small integers with MRTG may lead to slight errors in the yearly and monthly plots, with the values being less than the true values, so be careful not to interpret the results too critically. It would perhaps be better to multiply the results by (say) 1000 before giving them to MRTG, but you would then need to rescale the graphs and display text. if you needed to run the b2status command from its installed folder, for example if you have the SkyStar V4.4.1 drivers. Once the values are available as integers, they can be plotted with MRTG. Plotting the Quality and SNR requires a fixed 0..120 scale (allowing for up to 12dB). Plotting the BER is best done on a log scale, and strength a linear scale of 0..100%. I did add the Timezone option, to make sure the plots are in UTC (which may be called GMT by MRTG) so that plots from different countries may be more easily compared, and I added an XSize setting so that the graphs cover a slightly wide time range. These are entered as "default" values, i.e. using just the underscore as the target name. I'm no expert in MRTG, so if you have any suggestions for improvements of the following I would welcome them! # the image being 100 pixels larger at 600 pixels. # The TimeStrPos and TimeStrFmt put the date in upper-right corner. # The timeout option provides extra delay when calling external programs. When I moved PC Stamsund to the drivers V4.5.0 (for lower DPC latency, V4.4.1 don't install on XP SP3), I noted that sometimes the Perl/B2status command returned a blank result, and as I had the "unknaszero" option set, these made for spikes showing zero signal on the graphs every so often, even though the signal quality and SNR were fine. I therefore removed the "unknaszero" option (although it will make down-time less obvious). So far, the strength plots seem useless - with the backup PC Stamsund stuck on 38% (V4.5.0 drivers), and the test PC Hydra dropping from 40% to 25% for no apparent reason (V4.4.1)! I had to switch from MRTG to RRDTOOL. This was not an easy decision as transition is not that easy, but it offers some features which are useful (handling properly missing data, having negative values, properly handling date/time conflicts). Although it comes from the same developer and despite all my efforts to be as close as possible to MRTG look, resulting plots have a quite different look and feel (I've still some work do polish-up the presentation, as I'm discovering the tool). About the SNR, the tool used to "measure" is called femon. It reports either pure hexadecimal, or percents (actually the hex value /0xffff). 1) the signal quality is multiplied by 5./4. which corresponds to the jump I observed from ~60% to ~70%. 2) the SNR is encoded in a really weird manner. The chipset manual tells a cryptic: "A simple C/N estimator can be easily implemented by comparing the current indications with a primarily-recorded look-up table." The Linux drivers uses a conversion:	((65535-RAW_SNR)-41216)*3 / 65535 to get a value close to 1 at the card maximum. After "googling" a bit I found an obscure translation from raw values to dB: 19.02-0.0017*RAW_SNR which seems to correspond to the windows drivers values. I've applied both these back transformations to get values more common to what I used to get before. Still no clue on BER units. To what I've read so far I think I should divide my numbers by 2^12, 2^14, 2^16 or 2^18 (pick yours). Once you have MRTG creating the HTML and PNG files, you will need to create a routine job to upload those files to your Web server, and schedule that job with the Windows scheduler. I update every 30 minutes, the choice of update frequency is yours. Use the Advanced settings in the Windows Scheduler to repeat the upload task every 30 minutes for a duration of 24 hours, and schedule the overall task to run every day. Notes on using the Windows scheduler. prompt			N.B. only required for MOVEit Freely. Well, I expect you get the idea..... I found that the Windows-supplied command-line FTP program tended to hang with my ISP's Web provision, so I now use MOVEit Freely from Standard Networks instead. Almost identical command syntax, but you need to turn off per-file prompting with the "prompt" command, as shown above. If you are new to command-line FTP, there are some hints and tips here. Fred van den Bosch posted the following information in the MSG-1 self-help group for those who wish to monitor the size of the TelliCast FSY database file(s). You can see Fred's results here. Based on Fred's work above, I also added FSY file size monitoring. I used an alternative Perl script which takes the directory to be monitored as a parameter. I also made the "check status and report" size part a Perl subroutine so that it could be extended to any number of FSY files, and returned the value as bytes rather than megabytes, as MRTG is quite happy handling large numbers. In the example below, up to three FSY files are checked, for a RAMdisk size of up to about 380MB (the EUMETSAT recommendation is a RAMdisk size of 300MB). After several days running, I have changed my mind and after all think this produces a useful result for lost (unrecovered) packets. 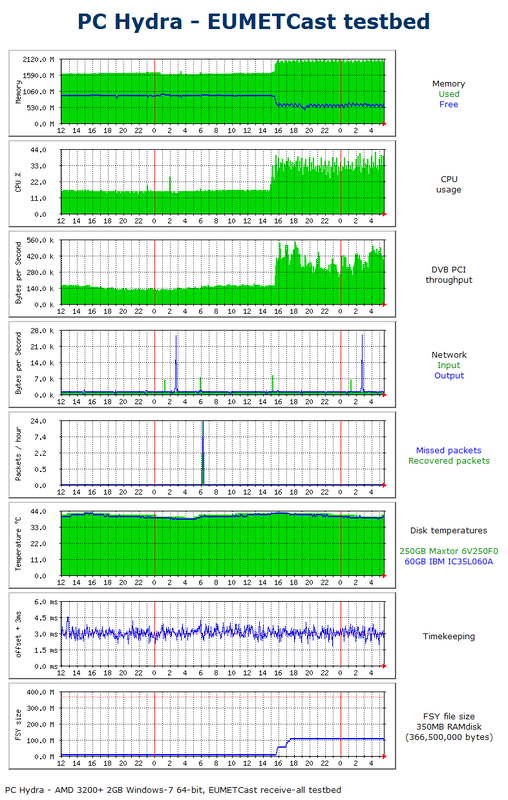 To help you test an installation on your own system, I would first suggest getting Perl, MRTG and SNMP installed on your system, and getting the network throughput data from the DVB card correctly plotted. Is the SkyStar card installed in the system where you are running MRTG? OK, I thought it was! When you run B2STATUS.exe, does it produce something like this? It is this output which the Perl Script parses. Please note that we have also found that the BER is almost always zero on some cards, unless the signal is about to crash completely through the floor!